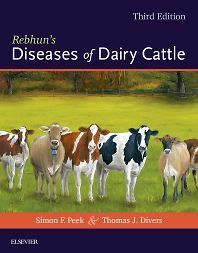 Diagnose and treat bovine diseases in cattle with Rebhun’s Diseases of Dairy Cattle, 3rd Edition - your all-in-one guide to bovine disease management. Organized by body system for quick, convenient reference, this complete resource equips practitioners and students with the knowledge needed to confidently diagnose, treat, and prevent bovine disease. All chapters are updated from the previous edition to reflect the most up-to-date diagnostics and therapeutics, including revised drug usage considerations. An entirely new chapter for this third edition provides easy-to-read, but detailed information on diagnostic laboratory sample submission so that you will know what tests are available and the proper samples to submit. Another entirely new chapter focuses on diseases of the bull. More color photographs and illustrations are provided so that clinical signs and pathology of the diseases and diagnostic procedures commonly used in practice can be visualized. With expanded coverage of herd diseases, this new edition meets the growing need for management of both diseases of individual cows and medical problems affecting whole herds.